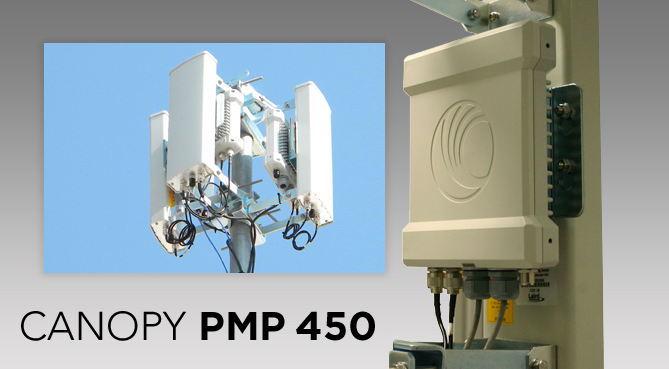 Cambium's New PMP450 Available in 2.4Ghz ! Now Available in the 2.4 GHz band, the Cambium Networks Point-to-Multipoint (PMP) 450 Access Point (AP) can provide more than 90 Mbps throughput. Service providers who are getting demands for more and more bandwidth can now upgrade to the to new high-throughput PMP 450 modules to enhance overall capacity; allowing more users and/or higher rate plans. Utilizing 2x2 MIMO-OFDM technology, new deployments can take advantage of Cambium Networks proprietary feature set, while achieving data rates higher than 90 Mbps. From the available synchronization options to its diverse feature set, the PMP 450 provides flexible deployment options that make it a good fit for high capacity, high reliability networks. CALL TODAY TO PLACE YOUR PRE-ORDER--4-6 Weeks lead time on first orders placed!